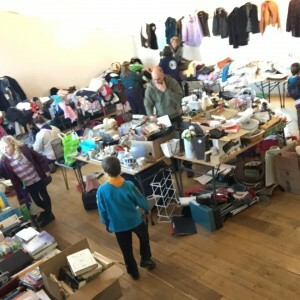 A huge thank-you from CATCH to everyone who supported our Jumble Sale on 8th February, as we comfortably exceeded last year’s total and raised just over £420 on the day.Thanks also to the Balsam Centre for hosting the event, to the Templecombe Beavers for supplying catering, to Gill Crowther and her family, Tim Fry and Bernadette Heyes among others, who contributed their own time and effort to support the cause; many thanks to all those who donated jumble and raffle prizes. In fact, so much jumble was donated that despite raising over four hundred pounds, almost half of it was still left, and has been passed on to various other charities for their own fund raising events. CATCH will be posting a report later in the year, once this money has been spent, to say what your noble efforts have achieved. We will, no doubt, be hosting the Third Annual jumble sale next February, but in the meantime we hope to be spending the spring and summer months actually working in the river. Our first litter pick of the year will be on Sunday March 1st, starting in the Recreation Ground at 9am; all helpers will be welcome, old and young alike.
. Hope you got message?